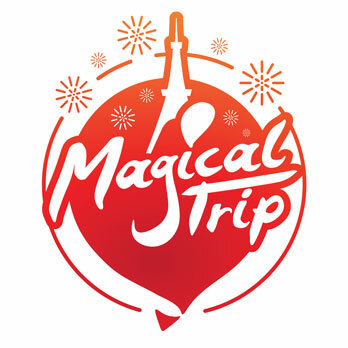 Must-see hot events held in Osaka& Kobe for August, 2017 brought to you by MagicalTrip staff. We highlight the best events for anyone visiting Osaka&Hyogo in August, 2017 and wondering what to do. Plan a trip around the various traditional events held in Osaka&Hyogo in August, 2017. This is a Fireworks Festival that delivers a powerful performance using Yodogawa as the main stage. This is a locally produced Fireworks festival with everything from planning, management, operation done by local volunteer staffs, businesses, groups, stores through donations by the locals. Every year, about 500,000 people make their way to the area to experience this event. The opening fanfare along with massive firework opening is nothing but spectacular. Using the latest technologies, the ‘Sui-chu Hanabi’ which is a firework that covers a vast area of the water surface is a specialty for Yodogawa Fireworks Festival. This show will leave anyone who watches in awe of the dynamic and magnificent display. Afterward, the 10 consecutive shots of 10-ball which is synched with the music puts everyone on their feet as they head toward the finale of the midair ‘Hanging Niagra’. A 3-month event held from July to September where many theaters and halls gather with Osaka castle as the main. There are many theatrical arts showcased. During the Obon season, there is an event called ‘Houkoku Odori de Iijanaika’. This performance reenacts ‘Houkoku Odori’ danced during the 7th anniversary of Toyotomi Hideyoshi, a dance called ‘Ise Odori’ that was danced during the chaos that occurred during winter and summer campaign of the siege of Osaka, and a riot that occurred at the finale of Edo period called ‘Eejanaikai’. At Osaka Castle, there is performance called ‘Disney on Ice’. At Kintetsu Art building, there is a Kabuki show called ‘Sora-no-Kai’ which is produced by some of the promising young Kabuki actors of the next generation. Access: Go from ‘Osaka-Jo Koen’ station or ‘Mori-no-miya’ station. A festival where you can experience Sendai’s Tanabata from a multifunctional city: Shin Umeda City. With the decoration of ‘Sendai Tanabata Matsuri’, one of Tohoku’s 3 major festivals, it combines the future and old times with Tanabata and high-rise buildings. Especially at `Ku-chu Teien (Hanging Garden)’ where you can get a big panoramic view of the night sky, and ‘Takimi Koji’ where you can enjoy retro styled streets, you will be able to experience a different taste of summer with a different environment. At restaurants inside the area, there are Tanabata-themed special menus as well as a menu that use Tohoku’s ingredients. What makes this place special is that you can get away from the hustle and bustle of the city and taste a different side of life you don’t experience every day. A local summer festival where 303 lanterns are floated downstream on Satsu River. 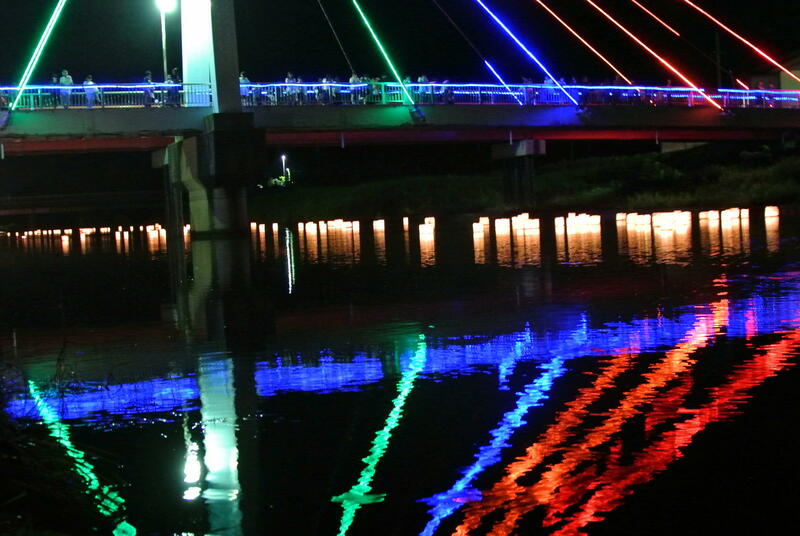 There is illumination on the Bridge of Satsu River which makes it a perfect and magical collaboration with the lights from the lanterns. On the stage setup by the riverbed, there is a band performance as well as a food stand such as shaved ice and Takoyaki that is popular with local’s who visit every year and tourists. In addition, since this year marks the 30th anniversary for this event, there will be 400 shots of fireworks which are double the amount compared to the previous years. The venue being very close to where the fireworks are launched from, you will be able to experience a dynamic firework show. Although this event is of a smaller scale, it has a homemade touch to it and is loved dearly by the locals. A major summer event where they shoot up approximately 1500 rounds of fireworks as well as Hyogo prefectures only ‘2-shaku firework ball’. This ‘2-shaku firework’ will send people off of their seats with its massive and dynamic sound. Since the fireworks will be launched from sea, Fukura port area will be the best viewpoint as the view that reflects off the surface of the water will be quite a scene! There will also be ‘Nipponmaru’, a cruise ship used to take customers to the whirlpool, giving viewers a better position to view the fireworks. This location is also usually popular for sunset views as you can enjoy the sea breeze during the daytime and do Hula dance or band performance. You can also enjoy Fukura Bon-Odori (Awa-Odori) or Tug-of-war held at a nearby elementary school. Access: From ‘Minomiya’ station or ‘Maiko’ station on JR Kobe Line, get on ‘Fukura’ bound bus for about 1 hr 25 min. Get off at ‘Fukura’. Or, ride 10-min from ‘Seidan Mihara IC’ on Kobe Awaji Naruto Jidousha-do via Prefectural route 31. Minors (no chairs) FREE ※Minors who require a seat will be charged as an elementary student. ※Reserve/Keep via the online. Pay at the reception desk before entering. The sight of 300,000 sunflowers in full bloom after receiving all the sunlight is something quite spectacular. With a close distance from Maizuru-Wakasa expressways ‘Tamba Kasuga IC’, the access is very good. At Yuzu-tsu district’s vast 7ha plantation, also famous for their Tamba Matsutake Mushroom, a maze filled with sunflowers makes an appearance during the summer. There is a handmade feel to the maze as runners who complete the maze receive a present by collecting all the stamps. Anyone can enjoy with people from families with kids to groups and couples. They also sell vegetable and bento boxes made at a local farm, as well as croquettes that use sunflower seeds. There are so many different types of local gourmet to try here. You can also try out freshly picked corn on the spot! You can also take home the cut-off sunflower leaves which will make a nice summer souvenir! 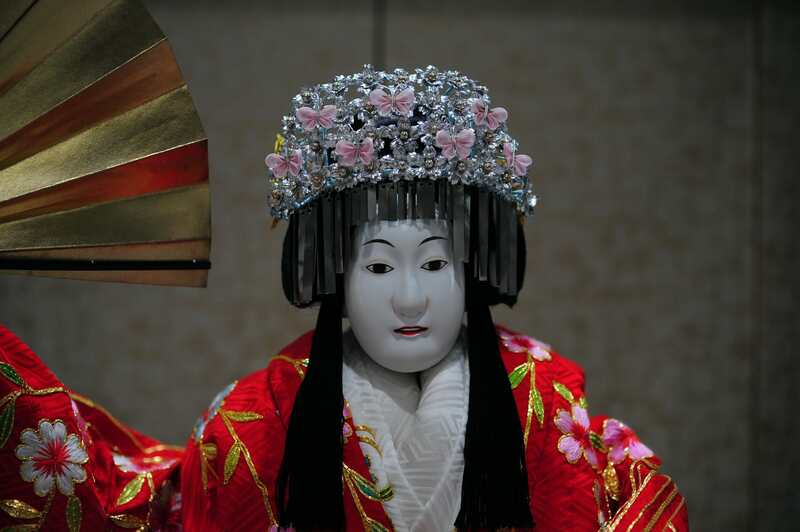 Bunraku is a special Japanese puppet show that started off in Osaka and is one of Japanese traditional performing arts. It is a combination of Performer/Shamisen/Doll all combined into one and performed all together. This performing art is registered as Nationally-designated Important Intangible Cultural Property as well as UNESCO’s Intangible Cultural Heritage. At summer Bunraku special performance, there is a show called ‘Kintaro no Oogumo Taiji’ where a big spider takes away a young daughter for sacrifice, and when Kintaro hears that, he takes on the spider using an ax. There is also a program where kids can enjoy called ‘Akai Jinba-ori’ which is a story about an honest working old man. What makes this event so special is that there are memorial goods and special cards for kids so that they can together with their parents learn and experience Bunraku. ※The first group for 8/5 (Sat.) (AM11:00～) is reserved only. For passengers taking the elevator, take the exit 10 elevator. ※There is space for wheelchairs. Contact us when making a reservation. ※You may not keep tickets for later purchase at the counter. Shitennoji is a historical temple built some 1400 years ago by Shoutoku Taishi to commemorate the victory of war. It is Japan’s first state-sponsored temple as well as a temple that doesn’t have a preference for the sect. At Shitennoji, there is a ritual held called ‘Urabon-e’. ‘Urabon-e’ is the official name for ‘Obon’ and is a ritual where they pay respect to their ancestors. There are two ways of paying respect: 1.) Read the Sutra or 2.) Light a lantern called ‘Mando Rosoku’. 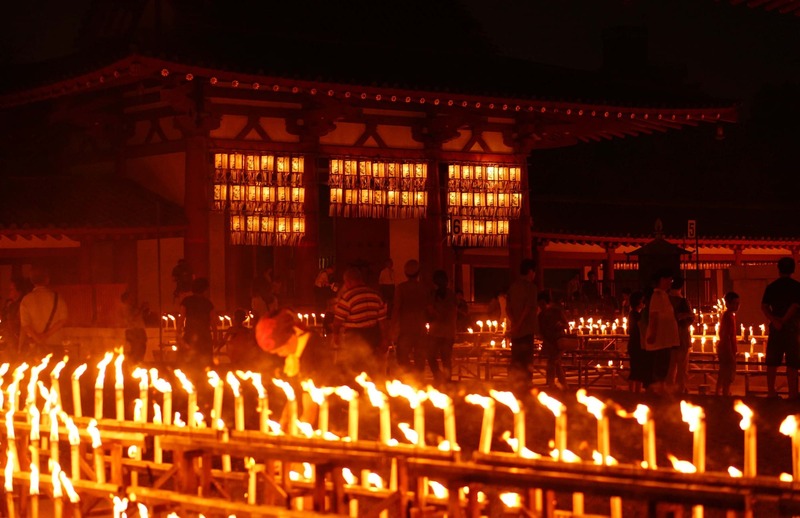 From the afternoon, there are about ten thousand candles lightened up with the names of the ancestors, as the central part of the temple is turned into an unreal atmosphere. You can also view the monks reciting the Sutra while walking around inside the temple. Walk 5-min south from ‘Shi-tennoji-mae Yuuhigao-ka’ station (exit 4)on Tanimachi Subway Line.